A Prosper family made the most of Tuesday's snow day. The Prosper school district originally delayed the school day by two hours but then canceled school, stating that getting buses on the road by 8:30 a.m. appeared to be too dangerous. "I don't mind that there's a school closing, because I have a teenage driver and I prefer that he be safe, so I appreciate the school district for that," Tana Cordy said. And the snow day wasn't wasted at the Cody home. Students in Prosper got a snow day Tuesday and some students used the day to build a snow fort. "We had the idea of making a snow fort," third-grader Eli Cordy said. Her sons spent about three hours building a snow fort standing at least 6 feet tall. It had enough space inside to fit at least three or four people -- an impressive feat, considering there was only about an inch of accumulation in their yard. "We used our front yard, and then we used our backyard," sophomore Isaac Cordy said. "When we ran out, we used the neighbor's yard and their backyard." The efforts were enough to draw some impressed neighbors -- and even respect from their mother, who returned from a grocery run to massive progress. "I appreciate anything that doesn't have to do with a video game," she said. 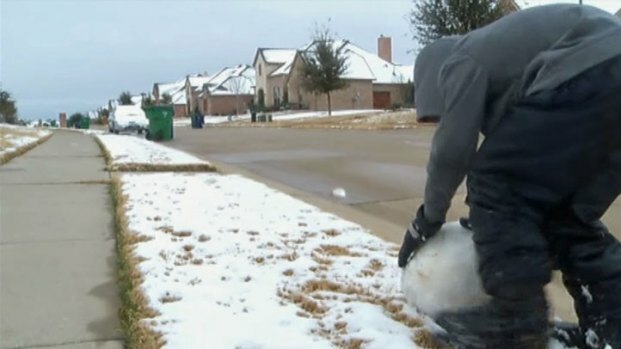 "We don't have snow that often in Texas, so we have to enjoy it when we do." The school district will make up the weather day on Jan. 21.